The final Arts Forum for the term at NADC will be held on Wednesday, September 16 in the Trapezium Gallery. 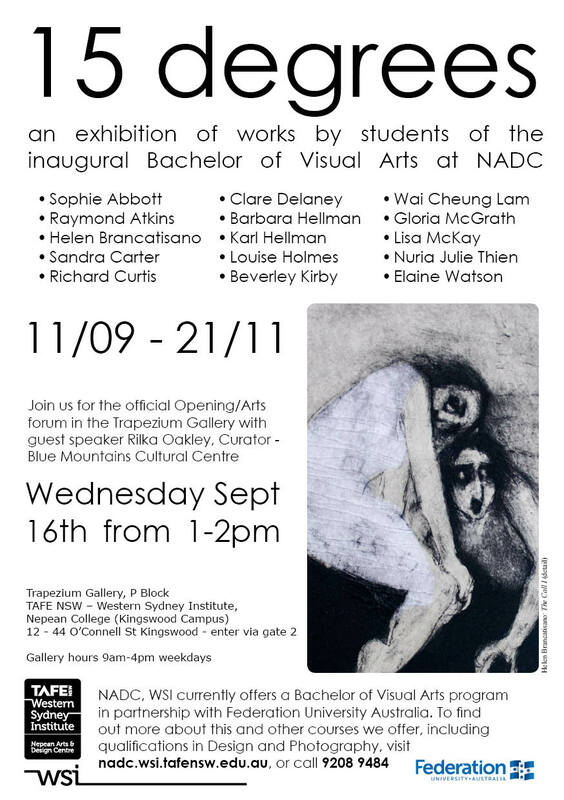 The Arts Forum will be a floor talk and an opening for the impressive current Trapezium Gallery show, 15 Degrees - works in progress by Bachelor of Visual Arts students at Nepean Arts and Design Centre. A sumptuous array of food will be served from 12.30pm, with the talk commencing as usual at 1pm (and running until 2pm). Our special guest is Rilka Oakley, who is a curator at the Blue Mountains Cultural Centre. Rilka will be in conversation with our BVA students about their work in the exhibition. We do hope you can join us, to celebrate the achievements so far of our inaugural Bachelor of Visual Arts students, and appreciate the potential of their work yet to come. The Bachelor of Visual Arts is a partnership program with Federation University. This means that students have the opportunity to continue their studies at Degree level at NADC, however the program is administered and issued by Federation University. You can read more about the Federation University Bachelor of Visual Arts program here. NADC has an innovative pathways program to the Bachelor of Visual Arts, that allows candidates to achieve three qualifications over the course of three and a half years of full-time study, with an exit point at the conclusion of each qualification. NADC staff will be available to provide information at 2pm (after the Arts Forum) on the Bachelor of Visual Arts program, or call the section on ph 9208 9484 for further information. If you hold the entry qualifications (the pink ones in the diagram above) you can submit your application to Fed Uni straight away at the following link! For location of study please select Western Sydney Institute.